Kevin McCarthy is on the left. 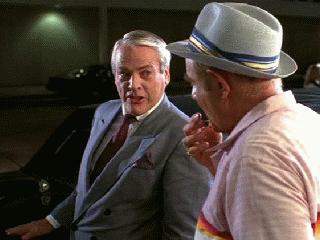 On the right is Stanley Brock as Weird Al's uncle, Harvey Bilchik. This scene is set at Tulsa International Airport. I believe Mr. Brock once acted in a public service announcement about alcohol abuse in which he says directly to the camera: "I catch you drinkin' on the job one more time, you're troo!" Mazeppa once did a parody of it. R.J. Fletcher (Kevin McCarthy) arrives at Tulsa International Airport. "and those are his good qualities." "The Outsiders". 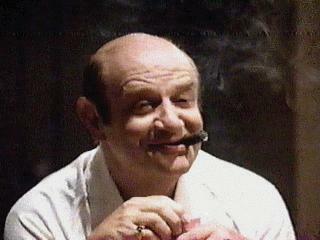 Gailard Sartain played a teacher in that one. Or is it 6th and Peoria? Nope, according to Weird Al, it is at 114 W. Archer, the Tulsa Pump Co. 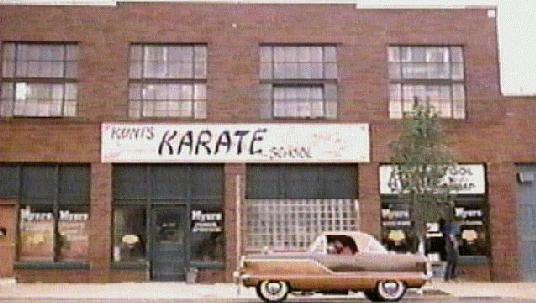 The location of the karate studio is actually on the southeast corner of Archer and Cheyenne, a few blocks from Greenwood. On the corner is Deadtown Tavern now. I used to live in the exact same room where Al and his friend lived. When I first discovered this, my friend who I lived with there discovered that it was the same place and that the same refrigerator was still there! And the alley where the Gandhi II stuff is shot is the alley behind the 320 S. Boston building (aka the NBT building) in the heart of downtown. 7/16/2005: Jo is the bassist for rock band The Engine Hearts. Read about Jo's personal connection with the NBT Weather Teller light signal, formerly atop the NBT Building, on the Weather page. ...note the distinctive lamps on the lawn. Is this an office building on Lewis? This building is on Lewis as you state. It is aptly named "6655 South Lewis Building" as the number above the door in the first picture verifies. 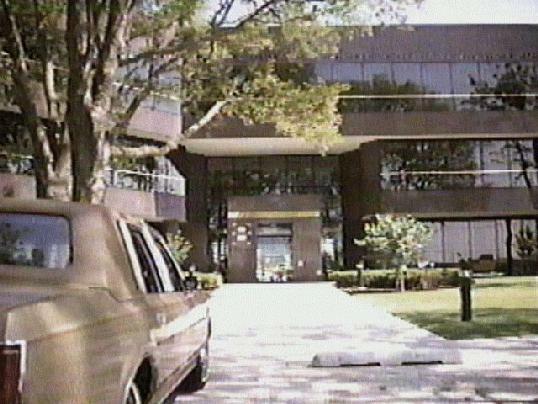 It is leased by the Trammel Crow Company and was built in 1986. I'm not sure of the old name but it did have another name before Trammel Crow took it over this last year. I can definitely verify that is the building as I do inspections for all of the Trammel Crow properties. That is without a doubt the place. 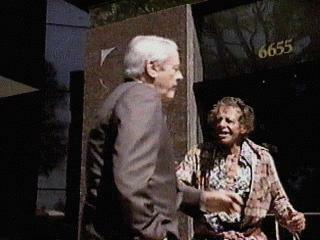 Big Edna just tossed Weird Al and his buddy out the door of her fine establishment. It sure looks like a Harden's Hamburgers. Big Edna was played by local girl Nancy Johnson. The "Burger Place" was indeed a Harden's (now something else). It is located on 15th Street between Sheridan and Memorial. They moved out of that building about a year ago to 4th and Sheridan into an old Dairy Queen...and they even display their UHF posters they had at the old location. 6835 E. 15th is currently "Miz Dee's Country Kitchen". 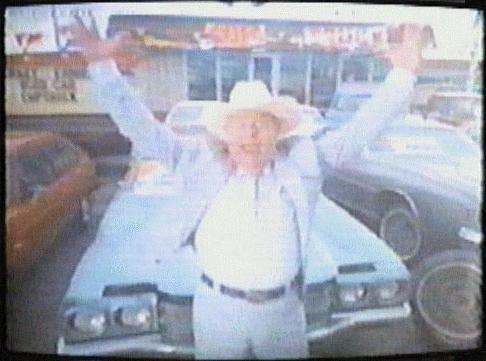 10/5/2003: It's now Jethro's Burgers & Stuff. 5/14/2009: Now Billy Ray's Catfish & BBQ, Jethro's Barbeque and Grill before that. This gentleman vows to club a baby seal unless you come on down. 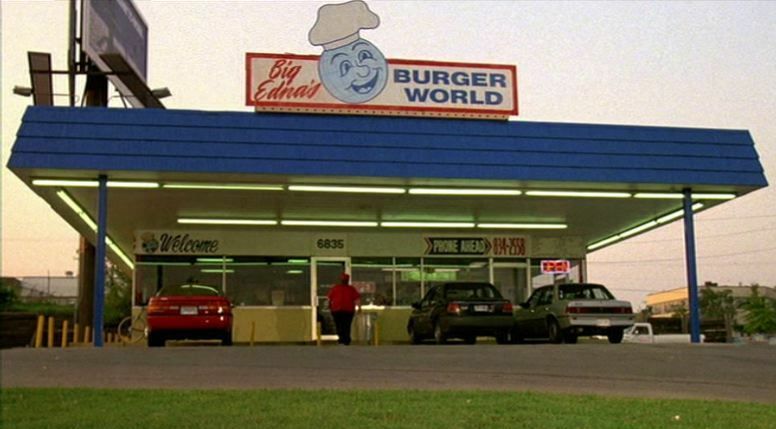 Tulsa's First Christian Church certainly was one of the locations used in Weird Al's UHF. 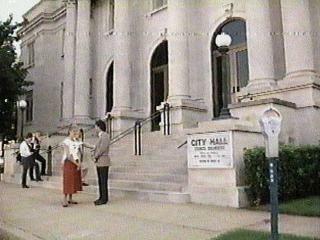 It served as the outside of the courthouse where "Noodles" (Billy Barty) was pushed down on the sidewalk. 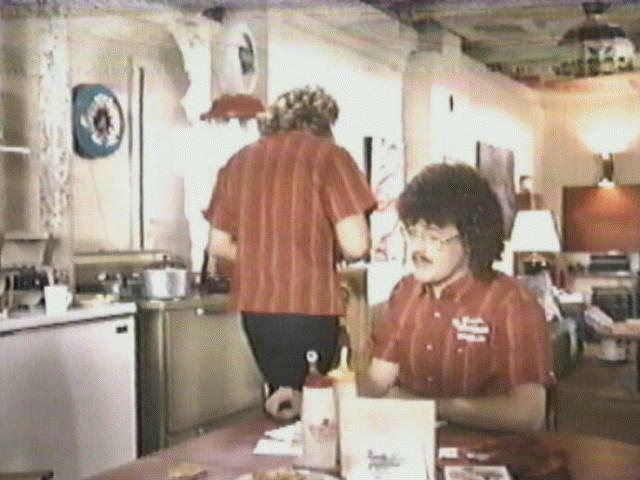 I was the KOED, Channel 11 station manager when Weird Al was shooting the movie in Tulsa. I got OETA to let the UHF crew build a news set in our studio, with the understanding that we could use it after they were through. The carpentry crew spent over a week building the set. When time to shoot, the crew filmed a million different angles of everything. What made it to the big screen was just a tight shot of the anchor -- no set - no nothing. OETA (at 811 N. Sheridan) used the set for a couple of years. Then we chopped it up. I took a small section home and made it into a bookcase for my son. 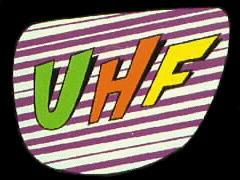 He's quite proud to have part of the UHF set in his bedroom. You use GPS (Global Positioning System) or Mapquest to take a tour of "UHF" shooting locales while picking up the digits needed to locate a hidden box of goodies...something of a road rally/treasure hunt.